HVAC Systems are the most targeted components for energy efficiency while aiming at reduction in energy consumption of an infrastructure. Rising construction activities, expanding industrial bases, implementation of stringent government regulations to the use of power, and improving standards of living are anticipated to drive the HVAC systems market. The US industry spends more than USD 30 billion, annually, on energy costs for motor systems. It is estimated that applying variable frequency drives could save 18% of the energy. There has been an increase in the installments of variable frequency drives on HVAC systems inside a building, owing to their advanced energy-saving features. Consequently, more opportunities for energy optimization can now be found across “small-to-medium" buildings, and all the buildings in the emerging regions of the world, majorly in the APAC region, where the number of households has grown exponentially over the last two decades. The United Nations expects that urbanization in Asia will reach 64.1% by 2050, which will further open up opportunities for building & construction industry in the region, thus augmenting the growth of the variable frequency drives market. Implementation of new regulations to achieve energy efficiency is driving the demand for variable frequency drives market in the United States. California updated its energy regulations through its “Title 24 building energy efficiency standards” to reduce the state’s energy footprint and carbon dioxide emissions. According to this latest standard, VFDs have to be installed on motors in HVAC applications with greater than 10 horsepower. This regulation is starting to expand into other states of the United States. Increasing emphasis on energy efficiency is driving industries to adopt energy-saving devices in order to reduce operational expenses. For instance, Len Busch Roses, a nursery for cut-stem flowers, deployed VFD to regulate airflow in snapdragon greenhouse with greater precision. 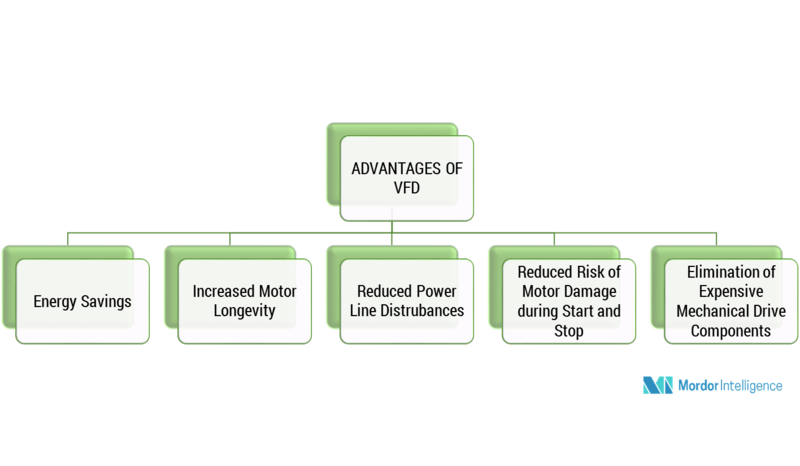 There is an increase in the installation of VFDs across various industries, like pumping, HVAC, machinery equipment, and packaging, as VFDs provide additional protection and monitoring capabilities. US water & wastewater utilities are increasingly using VFDs to become more energy-efficient, and decrease the operating costs.